Prosthetic dentistry is the specialty of restoring and replacing teeth. When replacing missing teeth, Dr. Johnson may recommend, bridges or a partial or complete denture. 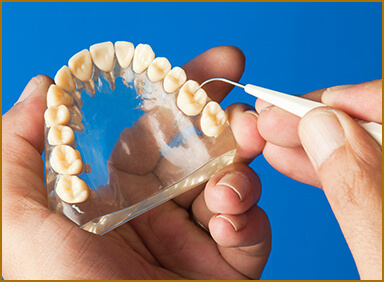 All dental work is fabricated by highly regarded prosthetic dental laboratories that are known for their top quality esthetic materials and precision design. Dr. Johnson meticulously selects the dental laboratories he works with to ensure that you receive the best possible result. In the following pages, you’ll find patient-friendly articles that explain the various types of dental prosthetics.